We would like to share with you multiple newsworthy and exciting updates for the extremely popular skin tightening treatment, Ulthera. New FDA Clearance: First of all, Ulthera has recently received additional FDA clearance to non-invasively lift lax tissue on the neck and under the chin. This is in addition to FDA clearance already in place for use in achieving a non-invasive eyebrow lift. New Ulthera Amplify software system upgrade is here! In addition, Dr. Russell Kridel and Facial Plastic Surgery Associates have the new Ulthera new software system upgrade, called Ulthera Amplify. The system update has added effectiveness and decreased patient discomfort. 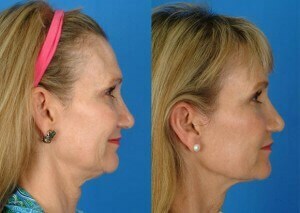 Dr. Kridel is one of the first plastic surgeons in the Texas Medical Center area to offer Ulthera and the new upgrade. About Ulthera Amplify: The three key elements of the Ultherapy Amplify software upgrade include: 1) Improved patient comfort – Patients do not require medication for treatment. However, patients can request it. 2) Increased efficiency through a more intuitive user interface for the physician 3) Updated treatment guidelines which include higher density treatments.The new guidelines with Ulthera Amplify have increased the full Ulthera treatment time slightly, from one hour to one hour, twenty minutes. With the new Ulthera Amplify software upgrade, patients do not require medication for treatment. However, for even greater comfort during the Ultherapy treatment we can apply topical cream. And, we can also use nerve blocks to further numb the skin if desired. Our Results Show and We Are Proud Of Them: Facial plastic surgeons, Dr. Russell Kridel and Dr. Angela Sturm-O’Brien have already performed a significant number of Ulthera treatments and have found that the best candidates not only like the results, but also appreciate the fact that it is a non-surgical treatment with virtually no downtime. When you come in for your consultation, you will review before and after photos. Ulthera Segment on Good Morning America: If you'd like to see the Ulthera treatment in action, check out this segment on "Good Morning America." The best way to get started on facial rejuvenation is to come in for an individual consultation. In that appointment, we will discuss your issues and determine if you are a good candidate for Ultherapy. Call us at 713/526-5665.